Applying nitrogen fertiliser to pasture in winter can increase dry matter production of grasses and broadleaf weeds and help reduce feed shortages in winter. This page covers the use of nitrogen fertiliser in meat and wool enterprises. If done properly, on average, an extra 17 kilograms per hectare of pasture dry matter can be grown for every kilogram of nitrogen applied. Nitrogen (N) from legumes may not be enough in late breaks and cold conditions to give optimal pasture growth: nitrogen fertiliser can fill this N gap. Nitrogen is essential for pasture growth which supports the production of meat, milk and wool. In southern Australia, pasture legumes are used to supply biologically fixed N – either directly or as a result of the breakdown of legume residues – to the non-legume component (grasses and broadleaf weeds) of pastures. Nitrogen fertiliser can boost winter growth during feed shortages: for instance, in late breaks to the season and with early lambing ewes. To gain the full economic benefits you must use the additional feed produced, and the largest benefits are when pasture feed replaces the need to buy supplementary feed. Using N fertiliser may allow you to defer grazing of pastures on other parts of the farm: large numbers of stock can be placed on the pastures which received N, allowing the remaining pastures to undergo more rapid growth. there are no other constraints to plant growth, such as nutrient limitations, waterlogging and low leaf area index. Note: livestock will reach maximum pasture intake when feed on offer reaches about 2500kg DM/ha. Is it better to add N rather than buy supplementary feed? In most cases, yes, if you have selected the pastures with the aforementioned conditions. Note that you may still need supplementary feed to cover the period of deferred grazing and until pasture has responded to the applied N.
Gains from applied N fertiliser range from 8 to 30kg DM/kg N (figures are derived from various trials in southern Australia). Lower rainfall areas with lower density pastures will be at the lower end of this range. At higher fertiliser rates (100kg N/ha and greater), loss of N – by leaching, denitrification and volatilisation – reduces the conversion of applied N to dry matter. Applying urea at 100kg/ha (46kg N/ha) could produce an extra 780kg DM/ha, which would provide an additional 520 sheep grazing days at an intake of 1.5kg DM/animal/day. This would allow you to run an extra 9 dry sheep equivalents per hectare for 8 weeks, if losses of dry matter occurred only by grazing. In Table 1, a value of greater than 1.00 means that it is more profitable to add N to pasture to get additional feed than it is to buy supplementary feed. Note that these figures do not take account of pasture or supplementary feed wastage, or of application costs. Note: Urea at $600 per tonne (t) equals nitrogen (N) at $1300/t. If feed on offer is below 800kg DM/ha, defer grazing for 1 week before application. Apply 40–50kg of nitrogen per hectare as either urea or sulfate of ammonia (solid or liquid form), defer for a week and then graze to maintain pasture feed on offer between 1500 and 2500kg DM/ha. Pastures generally recover a high percentage of the N from applied fertiliser. In one study, recoveries were 85% for application rates of 25–50kg N/ha, and fell to around 50% when 100kg N/ha was applied. Reduced clover content: regular applications of N fertiliser favour grasses and broadleaf plants over legumes, and legumes can be reduced by competition. Reduce the loss of legumes by grazing to keep the feed on offer below 3000kg DM/ha. Reduced N fixation by clover: if available soil N is high (from mineralised pasture residues or N fertiliser), legumes will take up soil N and use the energy saved for growth. If it does occur, N fixation is likely to pick up in the spring once soil N has fallen. Increased amount of broadleaf weeds: broadleaf weeds respond rapidly to applied N. Graze to keep the feed on offer below 3000kg DM/ha. Soil acidification: leaching of nitrate below the root zone will increase soil acidification. Avoid this problem by using a lower, split rate of N, and treat the problem by using lime to control soil pH. High levels of nitrate in plant tissue: nitrate concentration in non-legumes – particularly capeweed – increases immediately after applying N fertiliser. Although nitrate poisoning is uncommon, a real danger exists for pastures containing a lot of capeweed to which a high rate of N has been applied (100kg N/ha or greater) and stock are allowed to graze immediately following application. Tissue concentration of nitrate reaching 5000 to 15 000 parts per million (ppm) is a sublethal nitrate toxicity for sheep which may or may not affect animal production. Tissue concentration of nitrate above 15 000ppm is lethal to sheep consuming that plant tissue. Leaching is the movement of nitrogen in solution below the root zone. This can increase soil acidification. Denitrification is a microbially facilitated process where nitrate is reduced and ultimately produces nitrogen gas released to the atmosphere. Volatilisation is the loss of ammonia to the atmosphere from N fertiliser breakdown. Only use N fertiliser on pastures if supplementary feed is required. 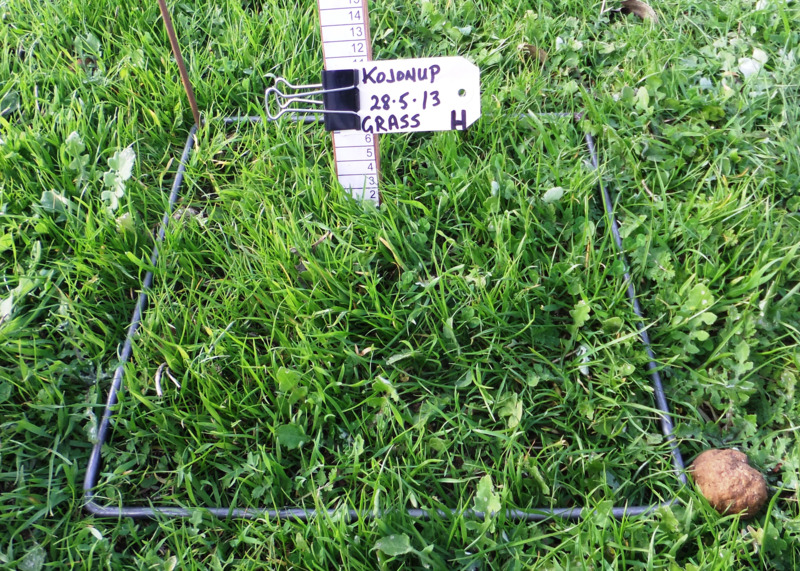 Select a paddock or portion of a paddock which is 50% or greater grass, preferably ryegrass. Do not use pastures which are typically waterlogged in winter. Test soil for nutrient deficiencies and apply fertiliser as needed. Defer grazing before application to enable pasture to reach 800kg DM/ha feed on offer. Apply 40–50kg N/ha as urea (100kg provides 46kg of N) or sulfate of ammonia (200kg provides 42kg of N) when pasture reaches 800kg DM/ha feed on offer. Use split applications to minimise losses when applying more than 50kg N/ha: apply the second application 5 weeks after the first. Apply urea within a few days of major rain (10mm): rain is required to wash N into the soil and prevent volatilisation. Apply sulfate of ammonia anytime because losses will only be slight. Defer grazing for about 1 week after application to allow pasture to grow and reduce the likelihood of nitrate poisoning (particularly if capeweed is present). Graze to maintain pasture feed on offer between 1500 and 2500kg DM/ha. Do not allow pasture to exceed 3000kg DM/ha because clover content will decline. If you are grazing the paddock with dry sheep, strip grazing is a good way to ration the feed. If needed, a second application of N can go on 5 weeks after the first. Most applied nitrogen will be taken up by 6 to 8 weeks.